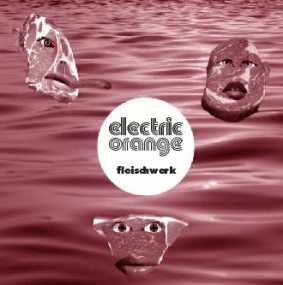 Electric Orange are an all instrumental and mostly improvised rock band that is very influenced by the likes of Tangerine Dream, Pink Floyd, CAN, Ash Ra Tempel, etc. This is a limited edition (300 numbered copies) vinyl LP. The band released another limited edition LP, Platte in 2003. This is the bands 7th real release, I believe. The band has also released a number of CDR only releases, perhaps 10. Anyway, the sound is very cool on this vinyl LP. The record opens with a short (20 second) synth thing and goes into an amazing track ("Gewächs") with such a cool bass line that the guitar and keyboards are on top of and it also features a sampled female voice. The next track, "Schrasng", does not really go anywhere at all interesting. Seems like they are lost somewhere in their jam that consists of mostly drumming, bass and strange sounds. Flip the record over and "Koodu" has a killer opening riff and bass line, but they don't really jam it out long enough. Too bad. After another short 30 second piece we get the long "Sonnenbart" (over 9 minutes), which is quite dreamy and spaced out. "Schatten", a slow building and happy piece, ends the record. Some pretty cool music but really only one stand out exceptional piece. I had expected a bit more.